One of the more noteworthy developments in recent days has been the move in bank stocks, which fell broadly on Wednesday amid growing concerns that the recent Republican electoral losses could hinder the party’s push to reform the U.S. tax code. They have also been pressured by a flattening yield curve. The spread between the two and the 10-year U.S. bond yields hovered around 70 basis points, its lowest level in a decade. A flattening yield curve is sometimes the precursor of an inverted curve, which has been a recession warning. The SPDR S&P Bank ETF (KBE) fell 0.67 percent Wednesday, bringing its YTD gains down to just 1.7 percent, underperformed the S&P by a wide margin. Now the question is whether recent weakness is a pause that refreshes or it’s a beginning of something worse? Below is an update look at a trade in KBE. The graphic below is from our “U.S. Market Trading Map”, show the near-term technical bias and trading ranges. As shown, the underlying is in a short-term bullish trend when the price bars are painted in green. The underlying is in a short-term bearish trend when the price bars are painted in red. Our “U.S. Market Trading Map” painted KBE bars in red (sell). 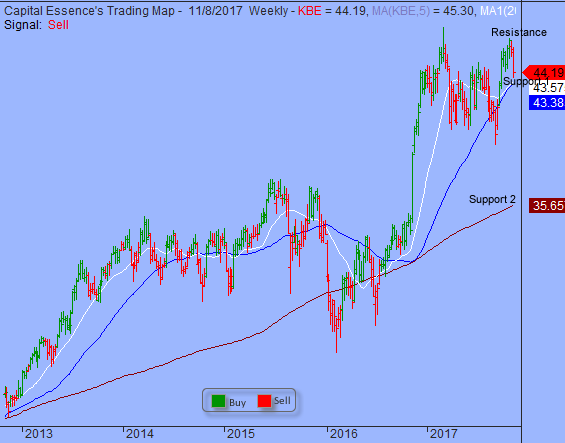 After a strong run of outperformance since late 2016, KBE peaked in March and bounce back and forth within the 40-47 trading range. This week’s downside follow-though confirmed…Click here to read more. You see, our trend-following system is very unique as it attempts to pick turns before others see them. Timing is everything and if you’ve applied our system correctly, you should have made a killing in any markets. This is just an example of many successful trades that our member had enjoyed recently. After all, aren’t you glad you subscribed? P.S. Take advantage of the 30 days special trial [new member only]. Join a small group of elite traders and receiving these daily trading ideas by click here to subscribe.